I'm slowly trying to catch up on my posts after being out of town for 3 weeks working, so I'm sorry if you've been checking for something new to no avail. 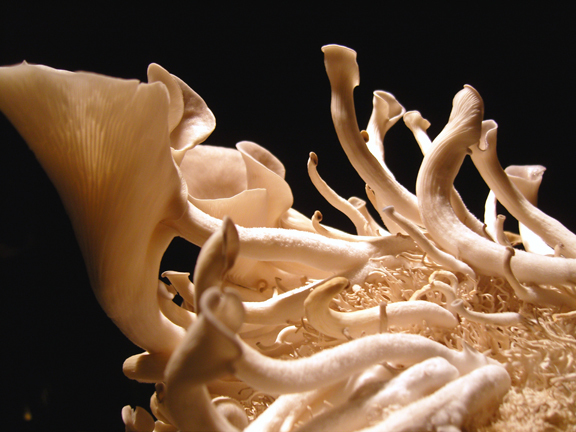 I currently have 2 countertop mushroom logs growing amazing Tree-Oyster mushrooms. One is mine, and the other is a friend's that I'm babysitting while he's out of town. Lucky me. Double the harvest of mushrooms. I also had a shiitake mushroom log, which grew some incredible fungus, but one of my cats knocked it off the counter and the log never recovered. It was good while it lasted, though. My wife and I couldn't believe the flavor of the shiitakes fresh off the log. There really isn't any comparison to store bought. We used them in a simple Japanese Nabe with fresh vegetables, tofu and Konnyaku. All three of the logs were obtained from a great mushroom shop, Far West Fungi, that's in San Francisco's foodie haven, The Ferry Building Marketplace. They were each around $28 including shipping to Los Angeles (I think they were $19 without shipping). The logs are made of compressed sawdust that is inoculated with mushroom spores. The log lives in a big clear plastic bag and the care is as easy as opening the bag various amounts throughout the growth process and occasionally misting water to maintain a properly humid environment. With proper care the logs should provide you with 6 or more crops (with dormant periods in-between). The two Tree-Oyster logs recently provided us with a harvest of 7 delectable ounces. Those were put to good use in a highly recommended recipe I found in February 2006's Bon Appétit magazine. Meanwhile, cook pancetta in heavy large skillet over medium-high heat until golden brown, about 3 minutes. Using slotted spoon, transfer pancetta to paper towels. Add mushrooms and 2 tablespoons oil to drippings in skillet. Sauté until mushrooms are tender, about 6 minutes. 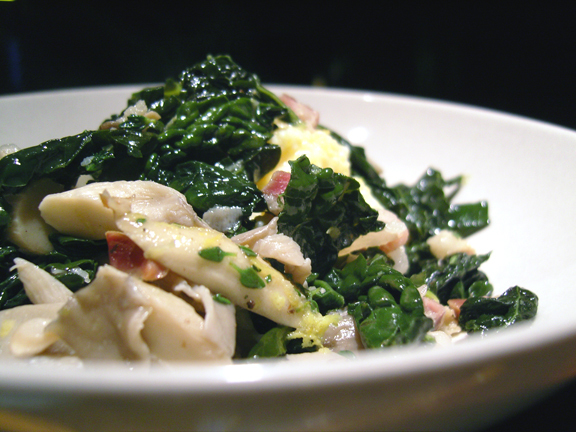 Stir in kale and pancetta. Add garlic and broth; simmer until broth is slightly reduced, about 6 minutes. Stir in thyme, lemon peel, and 2 tablespoons oil. Season to taste with salt and pepper. Whisk butter and Parmesan into polenta and divide among plates. Top with kale mixture. I love your blog, I wish i lived in a place conducive to counter-top mushroom logs!